We have some great goodies now available to you through your Report Pro program. Check out how to text invoices and estimates right to your customers, and our other new enhancements that will help your shop, as well. All free of charge! *For all Report Pro, Pro Pack, and Mobile Manager Pro users. Not only can you text inspections, but now you can text estimates and invoices! 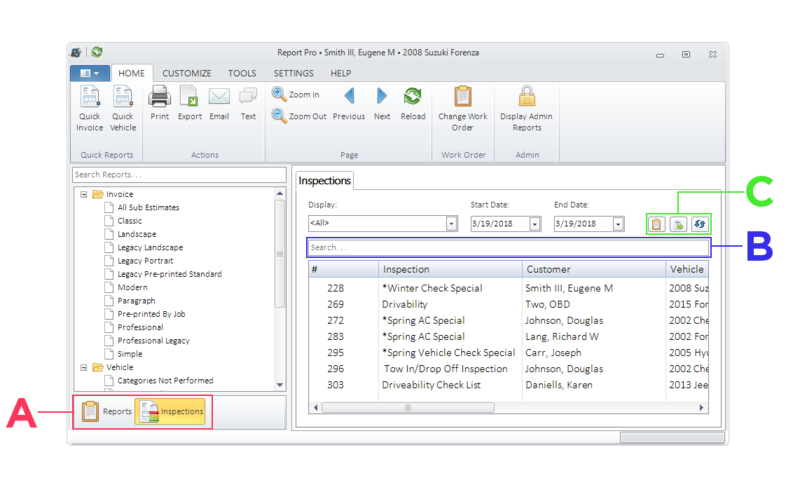 All you need to do is select the invoice, sub-estimate, or vehicle report you wish to send, and let it open in the main Report Pro window. Go to the Actions part of the Home icons, click on the Text icon, and next you will see the Quick Message window open. You can add some text to the message or just click the Send button. Note: You can only text items from the Invoice or Vehicle sections of the reports since no phone numbers are associated with any of the other reports on the menu. A search function is now available in the Inspections window to locate inspections faster. See letter “B.” Search by customer name, inspection name, vehicle, technician, and even status. Note: The search field only finds inspections listed in the lower window. You cannot use the search function to locate previous inspections that have been closed. Click on the Inspections button to open the inspections window. 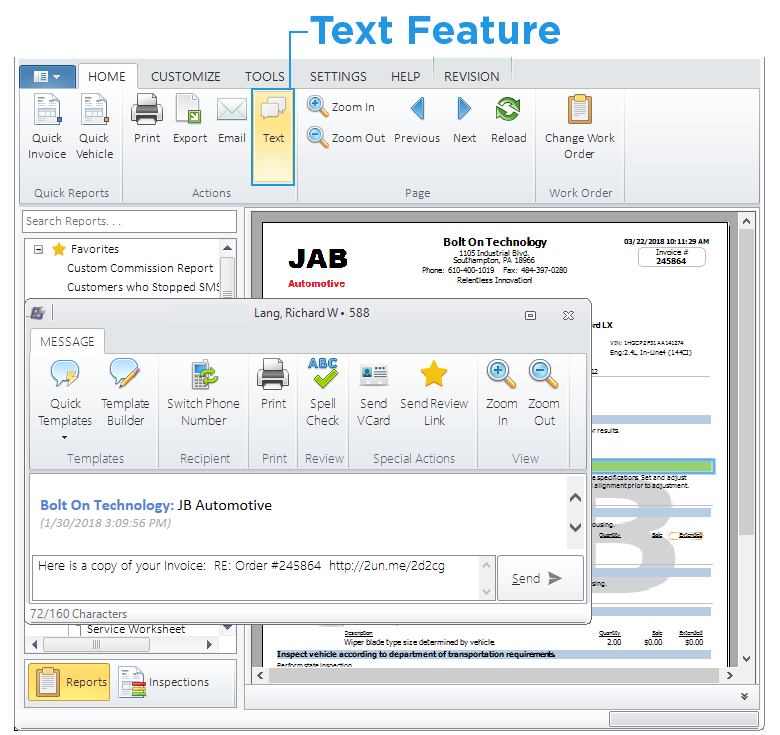 Upper right side, you will see three icons indicated by the letter “C.” With a repair or estimate open in your management system, click on the clipboard and any inspection open on that document will open. If you have two inspections assigned, both will open. The next icon to the right will open the general report card on how well you are doing with inspections overall. Clicking on the last icon to the right with the two blue arrows will refresh your inspection list in the window with the latest status of each inspection. You can now open multiple inspections at once. Click each one to open. Just by clicking on the tabs on the open inspections, you can choose the inspection you wish to edit. Note: The original Inspection Manager still lives under the Tools tab, but please note that we will remove this tool in the next update. 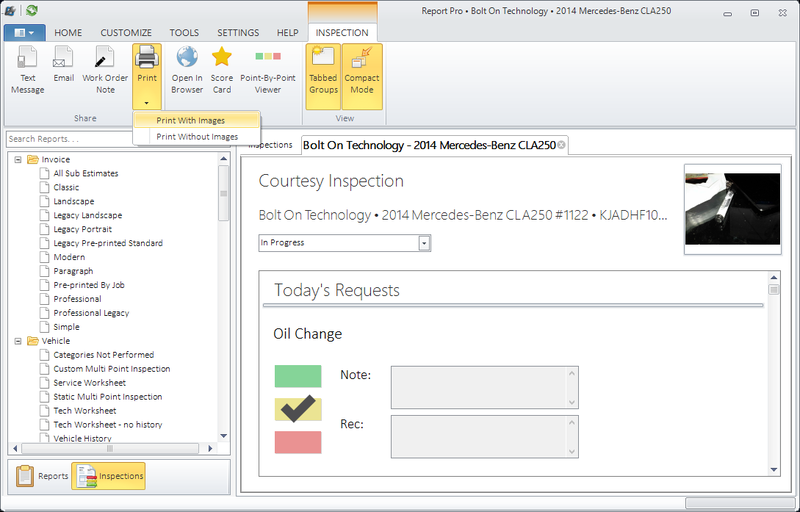 A note will pop up, informing you of this when you use the original inspection manager. For the customers who still like the feel and look of paper inspections, you can now print them with or without images. When you click the Print icon, a drop-down menu gives you the choice of “Print With Images” or “Print Without Images.” Select which version works for you, and it will print. We have also added additional tire companies to the registration list. 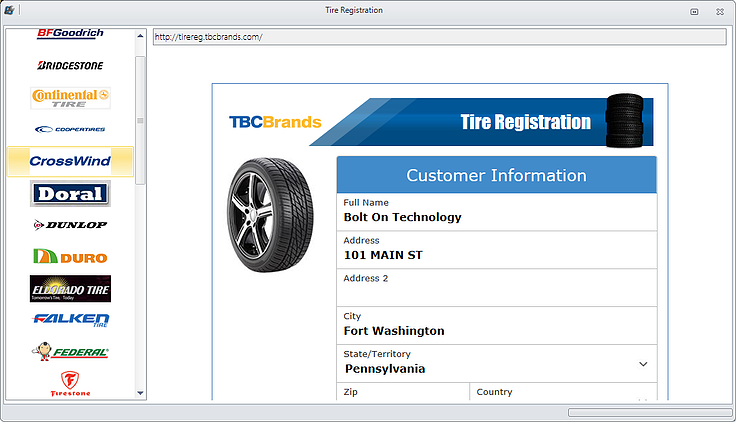 As always, with an estimate or repair order open, just click on the icon for the tire manufacturer you need, input the DOT codes and numbers of tires, then send the information with a click. Done.